How much traffic does it take to frack a well? That depends on how you count it – DRILL OR DROP? Traffic has become one of the most contentious issues in planning decisions for onshore oil and gas. Recently, it was behind the refusals of permission for fracking at Roseacre Wood in Lancashire and a conventional well between the West Sussex villages of Kirdford and Wisborough Green. It was also a key argument used by opponents of exploratory drilling in the Surrey Hills Area of Outstanding Natural Beauty. Yesterday, the debate over the volume of traffic likely to be generated by a proposed fracking site in North Yorkshire got more divisive. A local campaign group accused Third Energy of misleading residents in its literature about plans to frack an existing well in Kirby Misperton. A newsletter (see left) issued by Third Energy during public consultations earlier this year said traffic might be “slightly heavier” if its plans went ahead. But it said “disruption to normal routines would not be significant”. 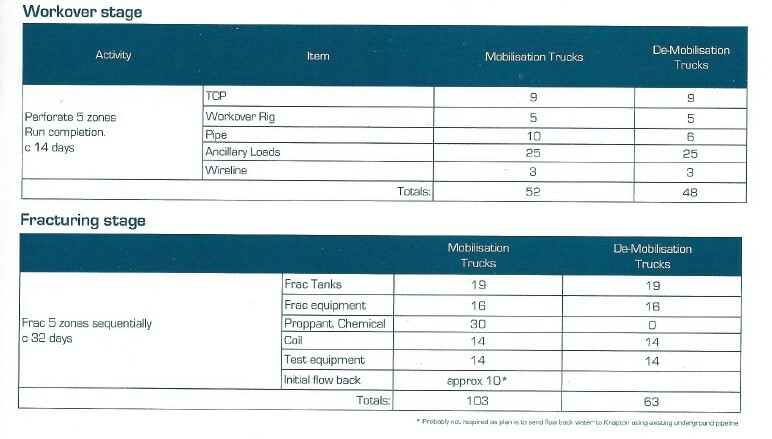 The newsletter estimated 265 lorry movements to the site during mobilisation, fracking, testing and removal of equipment, which would take place in the first eight weeks of operations. The newsletter gave no figures for car or light vehicle movements during these phases. Nor did it give details of traffic generated by well testing, production or abandonment, which would come later. 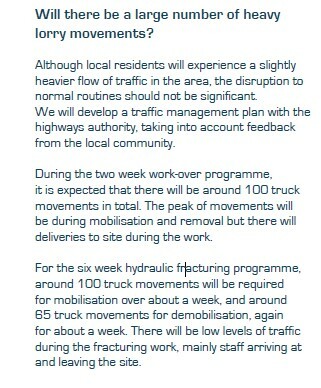 Another consultation document (see extract below) estimated 266 lorry movements for the same operations. This itemised the figures for the first eight weeks but also did not give information about the later stages. The figures in the company’s planning application, currently open for comments, predicted 910 heavy goods vehicle (HGV) movements in the first eight weeks: more than four times the newsletter figure. The application also predicted 504 car and light vehicle (LGV) movements for the same period. When well testing, production and abandonment were added, the total movement of HGVs, cars and LGVs reached over 14,000. “Many people are now wondering what other aspects of the application have changed since the consultation”. The Reverend Jackie Cray, who lives in Kirby Misperton, told the York Press yesterday: “We’re very concerned at this huge increase in HGV traffic, and the impact this will have on the village”. “In the leaflets Third Energy produced, round trips were described as one journey but in the planning application they are counted as two”. For anyone who wants to look in detail at the application, the traffic figures are in chapter 6 of the Planning Statement. This is found on page 4 of the Documents tab of the online application. The next phases of the well involve a 90-day production test, followed by an estimated nine years of production if the test were successful. The newsletter gave no details of traffic generated by the test or production from the well. Nor did it forecast traffic figures for abandonment and restoration. If all the traffic figures, in all the phases in the Planning Statement, are added together, the sums reach 2,240 HGV and 12,312 LGV/car movements: a total of 14,552 movements. And even that figure may not the final number for this application. There are no figures for vehicle movements for this operation, nor for routine maintenance of the borehole. The final date for comments on the Kirby Misperton application (NY/2015/0233/ENV) is 14th October 2015. The application can be viewed here. Frack Free Ryedale has published guidance for people who wish to oppose the plans. Links to Third Energy’s consultation newsletter and press release about its plans at Kirby Misperton. * The Planning Statement does not specify the length of the working week during production so we assumed a six day a week operation. What is the context? Are the traffic levels 10 over the same period or 10,000. If the former then a problem. If the later then not a problem. Context is always important. I also am a bit confused as to why this is a problem. Third energy have responded to public concerns re noise and fluid disposal and have adapted their plans. How many other trucks and buses will use these roads? The answer is lots and lots, and we do not mind that. It seems that any activity related to fracking is evil, when in fact it is a well researched and established technology. The numbers are extremely important and should be clearly and consistently reported – given applications have been turned down on traffic. One very important point here is the traffic – including the 900 plus HGV journeys will travel through the very centre of the village – I don’t care what the cause of the traffic – most people will be disturbed and would not consider this a positive. Car journeys likely don’t really get noticed by anyone unless they are so frequent that they begin to overwhelm the road network. I suppose this is personal, but if I was looking to buy a house I consider one car every 5 minutes to be very light traffic. One car every say 20 seconds would be very heavy for me, though I have many friends living on such roads who have no issue with it and those houses are not worth any more or less than ones 100m away just off of the main road. One car every 5 minutes would be 12 an hour, or 96 over an 8 hour day, or over 8 weeks 5376. 910 HGV movements over 8 weeks is 114 per week, over a 6 day period it is 19 per day. Assuming that it was kept in an 8 hour period during the day its looking at 2 per hour-ish. If an HGV takes 20 seconds to pass through the village then that is 40 seconds per hour of extra traffic. Obviously it wont happen like that though, it won’t all be spread our perfectly averaged. It would be sensible to do nothing around commuting times and school times, and convoy movements. The impact of heavy truck traffic in a fracking area is very large. Each well will have 900 or more journeys concentrated in the drilling and well completion (aka fracking) phases. It is peculiar but enlightening that an industry which clearly requires a high ratio of wells to gas output is so coy about the number of wells, the amount of water and the amount of waste involved in producing an appreciable amount of gas. The example of most fracking areas in North America points to the numbers and amounts being very large indeed. It is reasonable to assume that this leads to the coyness of the fracking industry and its proponents on this point. 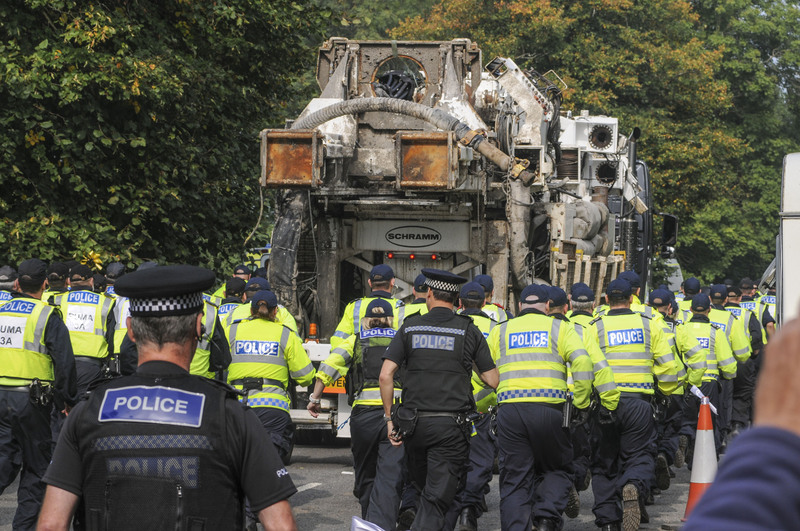 If fracking involved one well with 900 truck journeys there would be little opposition. In fact fracking involves hundreds of wells per year, each with its attendant heavy traffic. For this reason, among many other reasons, the opposition is significant and growing.